Are They Getting a Divorce or Is Everything a Meaningless Con? The internet has made us doubters. After a decade of being burned by viral content—from Lonely Girl to balloon boy to whatever Jimmy Kimmel did that one time—we’ve become more cautious. And, in some cases, a little callous. 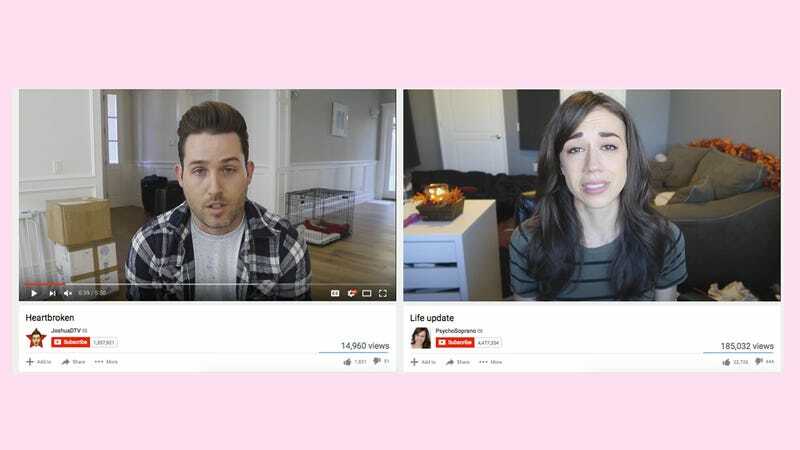 Take today’s news about Colleen Ballinger (better known as Miranda Sings) and her husband Joshua Evans (better known as Joshua DTV). Combined, they have almost 6 million YouTube subscribers—and that’s not counting another 6 million from Ballinger’s Miranda Sings account. On Friday, they each uploaded videos announcing their divorce after just over a year of marriage. They cried. They apologized. They begged their viewers to keep believing in love. And yet I watched them with a pronounced side-eye—inspecting their performances with my hands clasped together in front of my face, my index fingers extended and touching. Instead of saying, “Aw bb!” I thought, “What do you mean you can’t control this? You could have chosen not to upload an 11-minute video of yourself crying about your divorce?” How rude of me. Or was it smart of me? Only time will tell. Is this the end of a great love or an elaborate performance meant to promote Ballinger’s upcoming Netflix series, scheduled to premiere in just two weeks? I’m not sure, but I do know I’m uncomfortable.